Jim’s Red Shoes did What? Do you remember “Love Those Red Shoes” a few months back? Jim had tried on, and loved the fit of, a pair of Babolat tennis shoes. What colors did the pro shop have for this shoe? Only red in Jim’s size. This has been Jim’s first pair of red shoes since, say, four or five years old. Red shoes can generate a lot of attention. Service station attendants talking over the intercom, tennis partners, our opponents, and folks in the bleachers all cheer for the red shoes. Gosh, sometimes it seems Jim’s opponents might even be watching the shoes instead of the ball. Quite a legal distraction, the shoes could be a real help if this were only true. And Jim could have generated more comments if only he had worn the courts anywhere other than just on the courts. But these are expensive court shoes and Jim donned them only for hitting the tennis courts. He has an old pair of Nikes he reserves for painting or knocking around, a pair of Merrells for hiking or walking, and his Birkies for bopping around the block and for dancing. The red Babolat tennis shoes are specialists. The red Babolat Propulse3 shoes were everything they were billed as and more. These shoes provided Jim with unexcelled quickness and the most comfortable and snug fit in a tennis court shoe yet with room for his toes. He played a little wearing these shoes before we arrived in Mesa AZ. And Jim has played or hit 3-5 times weekly since we arrived here. Jim ended his hitting session and walked home to share his surprise with Debbie. The biggest surprise is probably because Jim hasn’t previously worn through the soles on any pair of tennis shoes. What happened? One of two things: Jim’s footwork has increased dramatically (a distinct possibility given the amount and type of instruction he’s gained this year); or these tennis shoes aren’t as substantial as previous pairs. Don’t call Michelin yet, we don’t want to distract the Michelin Man while he’s throwing tires at the big octopus-armed gas pumps or whatever those things are in the t.v. commercials. Jim’s contacting the folks who sold him these shoes. 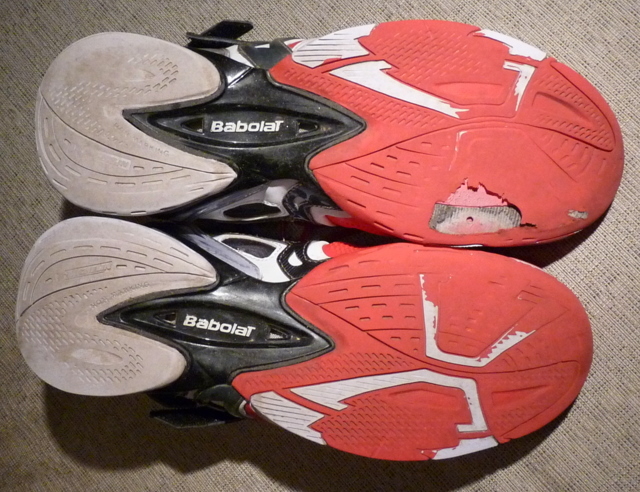 Word is, Babolat tennis shoes have a six-month wear guarantee. We sure hope so. We’re expecting Babolat’s U.S. distributors will come through for us on this. They have an opportunity to show us this was just a slightly thin sole on one of these shoes and the next pair will probably wear longer. Twelve hours a week for just nine weeks doesn’t seem like an awful lot of time in a pair of $110 tennis shoes. And until we resolve this Jim will have to play in his Birkenstocks or hiking shoes or, like he sometimes did when he was in junior high school, barefoot. These have been, hands-down, the best-fitting and most comfortable pair of tennis shoes Jim has played in. And hopefully we will find out they are shoes he can afford to wear on the tennis courts, comfortable or not.